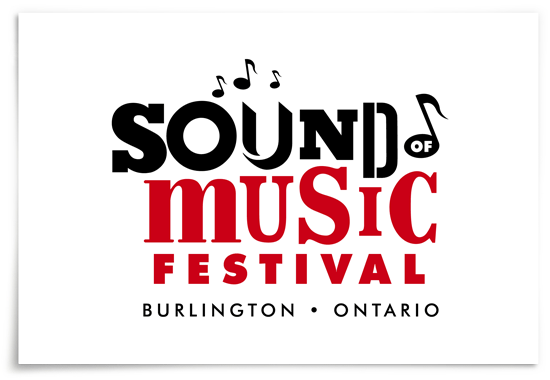 It’s been over thirty years since the Sound of Music Festival started drawing crowds to downtown Burlington for a free weekend of great music. And it still seems to get better every year! Local, national and internationally renowned acts now take to the stage in 10 performance areas on Burlington’s beautiful waterfront over four fabulous days. Unlike many other festivals, the Sound of Music Festival always has something for everyone – jazz, rock, folk, pop, blues, latin, big band, celtic, country and children’s entertainment. It has historically attracted talented musicians and delivered entertaining performances, but in 2009 organizers asked Compass Creative to help improve their stage presence. The Compass team obliged and had a great time composing a new face for the musical venture. The festival, now rocking its new logo, has been voted one of the Top 100 Festivals in Ontario (11th year in a row) and is one of the summer’s most sought-after shows. We’re honoured to have contributed to such a treasured Burlington tradition. We’re certainly looking forward to this year’s lineup. Hope to see you there!